Moving to NYC is a life-changing undertaking, both exciting and frightening. Whether you are relocating to the Big Apple for a job or you are pursuing a dream or adventure, going through the moving process is never as easy as we expect it to be. A smooth moving experience is guaranteed if your household belongings are in good hands and if you delegate important moving-related tasks to a professional moving company. Finding the expert NYC movers in such a busy city can be a bit complicated, so make sure you learn in advance as much as you can about your new city. The decision to move to New York City comes with a lot of advantages and disadvantages. You just need to be aware of them and deal with possible disappointments in a proper manner. It’s very important to have an adequate assistance and support when things get complicated. Luckily, NYC has a wide range of moving companies you can research and eventually choose one that meets your standards. When selecting a moving company bare in mind that going for the cheapest movers is not always advisable. Handing over your belongings to some strangers whose services are suspiciously cheap is something you want to avoid at all costs during your moving process. – Moving company’s website doesn’t provide information regarding the local address or license. In most cases they don’t have a local office at all. – Rogue movers won’t provide an in-home estimate. Instead, they will insist on a remote quote provided via phone or online. – Quotes are much lower than the regular ones. – They usually ask for a large deposit in advance and accept only cash payments. – They are answering the calls with some general statements that don’t include the name of the company itself. It’s in your best interest to find the balance between quality and cost when searching for experienced movers in NYC. Since there are a lot of fraudulent moving companies lurking in NYC, make sure you know how to identify them and avoid being one more fraud victim. Making a thorough background check of the moving company you are about to hire will help you get a clear picture of the situation. Professional and expert movers are required to meet certain standards in terms of safety, license and costs. Negotiating the best price for your move is totally all right as long as you are certain that you are dealing with a trustworthy moving company. – Start planning your move early so as to give yourself enough time to find suitable movers. As a result, your movers will have the flexibility to organize the move properly. – Moving during the off-season is a cost-effective solution for those who are flexible about the moving date. If you choose to move during the slow season, you might also get a discount or some special offers like specialty moving boxes for free or gratis delivery. – Beware of hidden moving costs. Even the lowest quote may turn into an expensive one if your movers are not completely honest with you. Remote estimates usually don’t provide the accurate idea of the costs you are going to incur, so make sure you get them in writing. 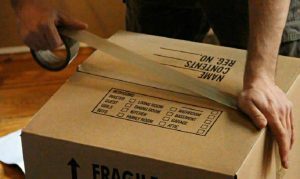 Before issuing an estimate, movers will need to know the exact type and amount of the items they will be dealing with. Luckily, there is a time-efficient alternative to an in-home estimate – a video estimate, which allows you to get an estimate through a secure live video chat with an experienced moving representative. – Have your belongings insured. If your homeowner’s coverage doesn’t suffice, purchase an additional insurance.